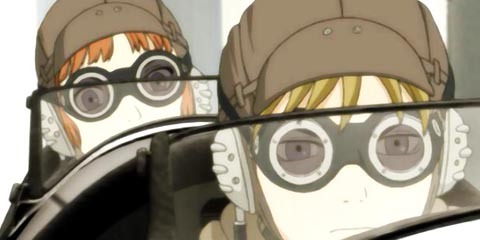 Claus and Lavie were always ready to prove just how great their flying skills were, but nothing could have prepared them for the mission that was to come! From Studio Gonzo comes a high-flying adventure that sets its sights to the skies above and goes much further. Strap yourselves in -- it's going to be a bumpy ride! Protecting the interests and dignity of the royal crown is first priority for Jack Hofner and Rowe Rickenbacker, better known together as L/R -- but which one's L and which one's R? Does it matter? Read on to find out more! Another year is passed, and the results of another Top 25 are available! Animefringe's annual tally seeks to find which anime sites on the web are hot items. Check in and see how your favorite site did! It's that time again! Time to look at our past mistakes and blunders and find a way to mature beyond the transgressions of previous years. That's right, it's New Year's resolution time, and Pat's ready to line up a whole new collection of them... to break... again. In this new column feature, Dillon will be taking us through many of the cultural nuances that have shaped Japan and granted it notoriety for being such a distinct and unique society. Appropriately, this month's edition is all about Japanese New Year celebrations and traditions.